The Indian Embassy in Nepal has issued a list of hotline numbers for the pilgrims stranded in Nepal and their family members. 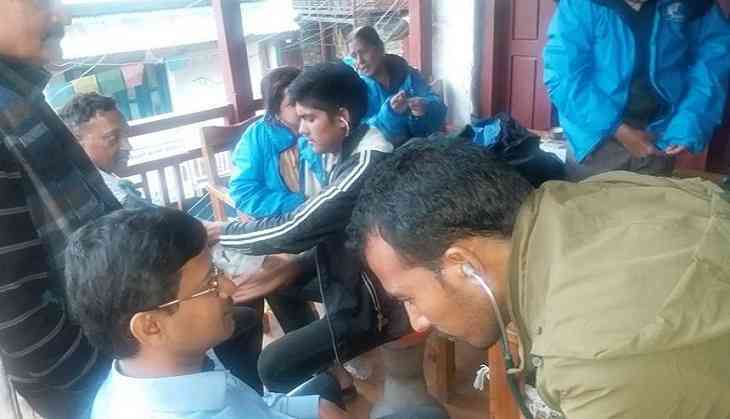 A number of Kailash Mansarovar Yatra pilgrims">pilgrims are stranded in parts of Nepal following heavy downpour. The helpline numbers are as follows: +977-9851107006,+977-9851155007,+977-9851107021, +977-9818832398. Hotline to contact language speaking staff: Kannada- +977-9823672371, Telugu- +977-9808082292, Tamil- +977-9808500642, Malayalam- +977-9808500644. The Embassy of India in Kathmandu is monitoring the situation along Nepalganj-Simikot-Hilsa route of Kailash Mansarovar Yatra (through Nepal). "As of Jul 3rd morning, the weather situation remains inclement and there is very little chance of operating evacuation flights.As per the latest information available with the Mission, there are about 525 pilgrims">pilgrims stranded in Simikot, 550 in Hilsa and another 500 more in Tibet side," a statement issued by the Embassy of India, Kathmandu read. According to the statement, the mission has placed its representatives in Nepalganj and Simikot, who are personally in touch with each and every stranded pilgrim. The representatives are ensuring that proper food and lodging facilities are available to all the pilgrims">pilgrims. The mission representative in Simikot has pressed in service of the available medical practitioner in Simikot to get a health check-up done for all elderly pilgrims">pilgrims. In case of any medical complication, they are being given preventive medication and medical counselling of dos and don'ts. "The mission representative in Simikot is also in touch with police authorities at police check post in Hilsa. The police authorities have been requested to take care of all the pilgrims">pilgrims and ensure best possible assistance to them." Mission has asked all tour operators to try and hold pilgrims">pilgrims back in Tibet side as far as possible since the medical and civic facilities on Nepal side are inadequate. They have further been told to accord first priority in clearing up the situation in Hilsa, which is the most infrastructure lean place in the area. Nearly 250 pilgrims">pilgrims from Karnataka are stranded in Nepal's Simikot after heavy rains caused landslips along the route of the Kailash Manasarovar Yatra. Thousands of Indian pilgrims">pilgrims take part in the Kailash Mansarovar Yatra every year via Nepal in the Tibetan Autonomous Region of China ahead of the monsoon season. The tour is organised by the Ministry of External Affairs each year between June and September in cooperation with the government of People's Republic of China through two different routes - Lipulekh Pass (Uttarakhand) and Nathu La Pass (Sikkim).